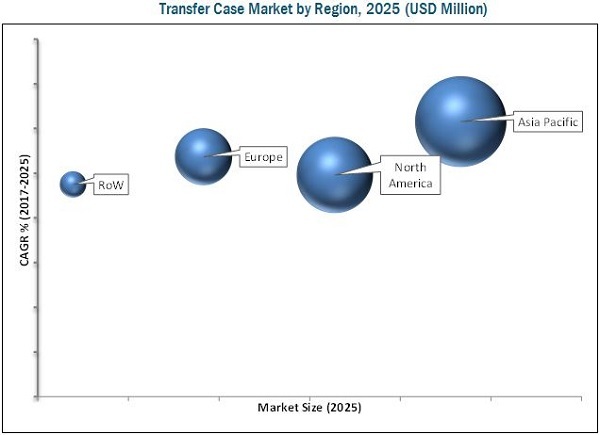 [147 Pages Report] The transfer case market is valued at USD 9.01 Billion in 2016 and is projected to reach USD 20.33 Billion by 2025, at a CAGR of 9.56% during the forecast period. The base year considered for the study is 2016 and the forecast period is 2017 to 2025. Various factors such as an increase in global demand for SUVs (with AWD systems), increased fuel efficiency with the help of advanced and smart AWD that provides 2WD or AWD according to the vehicle requirements, increased sales of hybrid segment vehicles equipped with AWD, and recent penetration of AWD in premium sedans are expected to fuel the transfer case market. The research methodology uses secondary sources that include associations such as International Organization of Motor Vehicle Manufacturers (OICA), Emission Controls Manufacturers Association (ECMA), European Automobile Manufacturers Association (ACEA), Environmental Protection Agency (EPA), and International Council on Clean Transportation (ICCT) and paid databases and directories such as Factiva and Bloomberg. 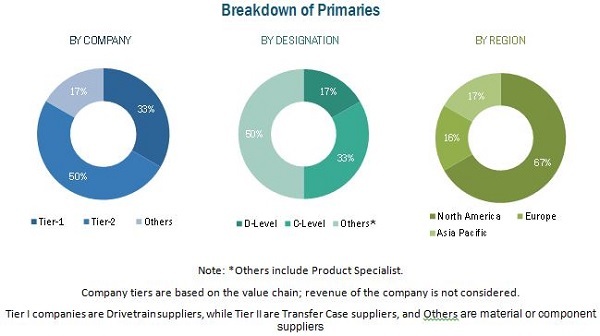 In the primary research stage, experts from related industries, manufacturers, and suppliers have been interviewed to understand the present situation and future trends in the transfer case market. The transfer case market for OE has been derived from forecasting techniques in which ICE and Hybrid vehicle production and sales data is multiplied by the penetration of transfer case in different vehicle types. The penetration is calculated by model mapping in every country considered in the study. Data sanity check has been done by considering product revenues of leading OEMs in the transfer case market. The transfer case market ecosystem consists of transfer case manufacturers such as Magna (Canada), BorgWarner (US), GKN (UK), Aisin Seiki (Japan), and ZF (Germany). The transfer case is supplied to major OEMs in the automotive industry including Nissan (Japan), General Motors (US), Toyota (Japan), and others. The transfer case market is estimated to grow from USD 9.79 Billion in 2017 to USD 20.33 Billion by 2025, at a CAGR of 9.56% during the forecast period. The key factors driving the transfer case market are the increasing demand for safety and traction in extreme weather or surface conditions and need for easy maneuverability. A steady increase in the use of AWD and 4WD in SUVs and premium sedans has fuelled the growth of the transfer case market. Other growth drivers include the increasing sales of hybrid electric vehicles owing to the improving infrastructure. The PHEV segment is estimated to be the fastest growing transfer case market, by hybrid vehicle type. Asia Pacific is estimated to be the largest transfer case market for HEVs and PHEVs. Strict emission norms, rapid development of charging infrastructure, and government incentives have helped to increase the sales of HEVs and PHEVs in the region. The sales of HEVs and PHEVs in Asia Pacific increased by 19% and 36%, respectively from 2015 to 2016. Several OEMs are using a transfer case in HEV and PHEV vehicle segments to differentiate themselves from their competitors. Various governments have also taken initiatives to increase the sales of HEVs and PHEVs. For instance, the French government announced subsidies on the purchase of PHEV and HEV vehicles. Thus, the transfer case market for PHEVs and HEVs is expected to grow considerably. The chain driven transfer case is estimated to be the fastest growing segment of the transfer case market. Chain driven transfer cases have replaced gear driven transfer cases as they are lighter in weight and offer quiet operation and smooth transmission. However, gear driven transfer cases are used in construction equipment, farm tractors, and on-road heavy commercial vehicles such as garbage truck and military trucks. The report classifies the off-highway transfer case market into construction equipment and farm tractors. The transfer case market for construction equipment is larger as compared to farm tractors. Some of the different types of construction equipment that offer AWD or 4WD are backhoe loaders, articulated haulers, and wheel loaders, among others. Some examples of models equipped with transfer case are Caterpillar 434F2, 12 M2 AWD, Volvo A30D with D10 engine, and Komatsu WA320-7. The four-wheel drive is offered in tractors with a power output of >100 HP. Asia Pacific is estimated to be the largest market for transfer case during the forecast period. The high share of passenger vehicles in the total vehicle production and growing demand for Sport Utility Vehicles (SUV) are driving the transfer case market in the Asia Pacific region. While the penetration of transfer case in passenger vehicles is expected to range between 15 and 18% in the region in 2017, it is expected to increase to 22–24% by 2025. The market growth can be attributed to the rapid increase in the demand for high-performance SUVs equipped with 4WD or AWD that offer better safety and comfort. Battery electric vehicles do not have a transfer case for power distribution. The increasing demand for battery electric vehicles can thus hinder the growth of the transfer case market. The penetration of BEV is increasing year on year in various regions. The increasing popularity of these vehicles will impact the transfer case market in the near future. The transfer case market is dominated by a few global players and comprises several regional players. Some of the key manufacturers operating in the market are BorgWarner (US), Magna (Canada), GKN (UK), ZF (Germany), Aisin Seiki (Japan), Dana (US), American Axle & Manufacturing (US), JTEKT (Japan), Schaeffler (Germany), and Meritor (US). *Details on Overview, Products Offerings, Developments, SWOT Snalysis MnM View Might Not Be Captured in Case of Unlisted Companies.